Only two-thirds the thickness of our older models, they do away with projections that get in the way. These brakes are dedicated for holding and emergency braking while allowing for space-saving mountings. Their major point is the much lighter rotor, which successfully reduces racing wear dramatically. 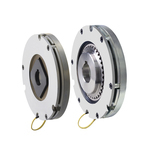 The lighter weight lowers the inertia, enabling their incorporation without degrading the response of servo motors.